Type 1 diabetes is an auto-immune condition. When a person suffers from type 1 diabetes, the immune system is activated with the purpose of destroying the pancreas cells which produce the insulin. 1 What is type 1 diabetes? 1.4 When to Visit the Doctor? The answer to the question what is type 1 diabetes is quite clear, but the issue of determining the cause to this reaction are yet unknown. Type 1 diabetes is currently not linked to any modifiable lifestyle factors. Therefore, it is clear why there is no existing cure or preventive measure for this particular disease. 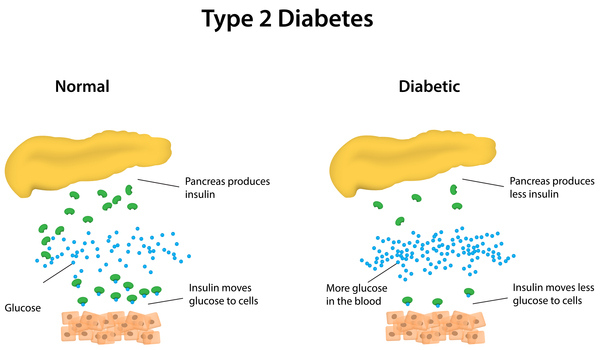 When type 1 diabetes occurs, the pancreas stops producing insulin. The pancreas is a large gland located behind the stomach. When the immune system in the body destroys the cells that make the insulin in the pancreas, this condition develops. Without the insulin, the body is unable to turn sugar into energy. People diagnosed with type 1 diabetes are forever dependent on insulin. The purpose of this insulin being consumed is to replace the insulin that is no longer produced by the body. Patients who suffer from this type of diabetes have to test the levels of their blood glucose several times every day. If the body burns its own fats as a substitute that releases chemical substances in the blood, these can accumulate and be life threatening to the patient. So, if the daily dosage of insulin is not provided to the patient, this may seriously threaten their life. This condition is called ketoacidosis. The onset of this type of diabetes most commonly occurs in people under 30 years. However, there is no limit whatsoever about the age when type 1 diabetes may occur. Type 1 diabetes can strike both adults and children at any age. It usually comes on suddenly and causes dependence on insulin for life. Additionally, it carries constant threat of many possible complications if the patient is not properly treated. Living with type 1 diabetes is not an easy task. People who suffer from this disease must balance the insulin doses very carefully and do this every day till the end of their lives. The insulin doses can be injected multiple times a day or infused continuously through a pump. The balancing actually depends on the eating and performing of activities throughout both the day and the night. Additionally, patients must also measure glucose levels for a minimum of 6 times a day. This is done by pricking a finger for blood. Even if the patient is exposed to an utmost attention, the risk of dangerous low or high blood-glucose levels is still present and life threatening. This is something type 1 diabetes patients struggle with on a daily basis. Despite the fact that this disease is highly difficult and serious one, the treatment options are constantly improving. Nowadays, people with type 1 diabetes can lead active, full life if they only take all necessary measures to make this happen. People suffering from this disease claim that it is highly difficult thing to live with. The biggest concern they have is based on the life-threatening characteristics of this disease. However, living with diabetes is now possible and people who are diagnosed with it can live normal life. Type 1 diabetes was previously called juvenile diabetes, because it is usually diagnosed in children and young adults. When the pancreas is healthy, the body breaks down the starches and sugars a person eats in glucose, which is used for energy. When diabetes develops, the main hormone needed to get the glucose out of the bloodstream and into the body cells is no longer produced. Therefore, insulin therapy and many other treatments are introduced to patients, which can help them learn how to manage the condition and live a long, healthy life. Even if one person is diagnosed with diabetes, this disease affects the whole family. This is especially the case when a child is being diagnosed with type 1 diabetes. After the initial shock of the diagnosis, the entire family has to adjust to living with diabetes. A little preparation can go a long way and the child can be enabled to resume all day-to-day activities, including exercising and doing sports. Diabetes does not limit people. Sure, they will have to make sure their insulin is on normal levels, especially when doing physical activities, but this does not mean that a child cannot achieve their highest goals. There are professional athletes, congressmen, footbal players and rock stars that were diagnosed with type 1 diabetes and still became very successful. The research in this area is conducted thoroughly and there are many potential ways to enchance the process of cell division with the purpose of promoting beta cell expansion. If this results in success, both type 1 and 2 diabetes may truly benefit from the results. Some researchers think that the best way to prevent type 1 diabetes is by interrupting the autoimmune process of destroying the cells. It has been discovered that molecules that reduce inflammation can also target and increase the factor expression, commonly found on immune cells. This factor diminishes the cell’s ability to attack the healthy cells of the body. If this factor is increased on the immune cells, the body may be able to keep the cells in check and prevent the development of type 1 diabetes. The regulation of blood glucose levels is highly important when it comes to avoiding diabetes complication, but this is very difficult without occasional hypoglycemia. One of the biggest barriers to artificial pancreas approval is the inability of the systems that deliver insulin to prevent the appearance of this low blood glucose appearance. Researchers think that the development of automatic systems can solve this problem. These systems should be created so that they can monitor the levels of glucose and stop the insulin flow if the glucose falls too low. However, this approach cannot entirely prevent hypoglycemia. People are being diagnosed with type 1 diabetes almost daily. Living with this disease is quite difficult for the patient and everyone around him, but new researches are conducted almost daily. The treatment for type 1 diabetes has now reached a much higher success than previously and people suffering from this disease can finally live a happy, healthy life without those terrible life threatening complications. The only thing necessary is for them to be very careful and patient with the treatment that unfortunately, lasts their whole life.